Bjork grew to love the game at an early age, playing pond hockey in Wisconsin. Photo by Tom Sorensen. Perseverance is something that Anders Bjork takes to heart. After all, it’s something small his dad drilled into him when he was growing up. For Anders, that perseverance has led to USA Hockey's National Team Development Program in Ann Arbor, Mich., where the 5-foot-11, 177-pound forward scored 12 goals with 24 points in 56 games in his first season while playing for the U.S. National Under-17 squad. Bjork’s journey to Ann Arbor began on the frozen ponds in Mequon, Wis. Growing up, hockey was always a part of his family. In addition to Kirt’s college and pro career, Anders’ uncle, Dave Arkeilpane, won an NCAA title with Michigan State and his cousin, Erik Condra, is a right wing for the Ottawa Senators. Anders started skating around age 4 when his older sister Brinya was on a team and Kirt was her coach. Kirt coached Anders until his son was a Peewee. 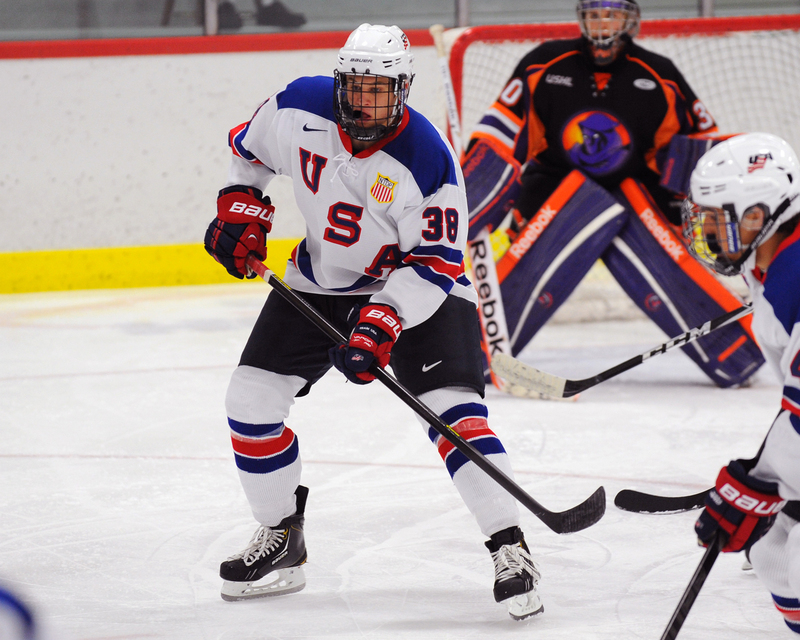 As Anders rose through the ranks of youth hockey, he set a goal of one-day playing for the NTDP. “Some of the guys from the Chicago Mission program where I played came here,” he said. “I wanted to be like them and I looked up to them. I could see how much they succeeded from the program. Plus, Bjork already had a “connection” to U17 coach Danton Cole. Arkeilpane and Cole were teammates at Michigan State as the duo helped the Spartans capture the 1986 NCAA title. Still, the transition from Midget Minor to playing against United States Hockey League and college competition is never easy. One of Bjork’s favorite memories from 2012-13 was winning the Four Nations Tournament in November in Switzerland, but more than anything he said he has enjoyed getting to know his teammates this season. Bjork plans to be back in Ann Arbor in 2013-14 to play with the U18 team before moving south to play for Notre Dame, following in the footsteps not only of his father and of Condra, who played on Notre Dame’s 2008 Frozen Four team, but also following his mother and two sisters to South Bend. And with a little perseverance, don’t count Bjork out for anything.